Artists make formal choices to get certain results. Rene Magritte’s painting style can seem formulaic, almost mechanical, but the point of this restraint is to enable the surreality of his images. There is nothing to be gained, and much focus to be lost, by painterly bravura. 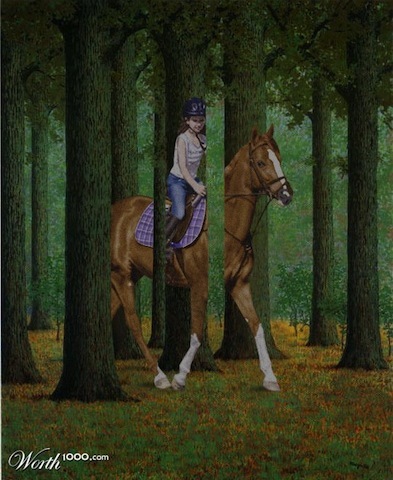 Contrast the coherence of his “Rider in the Woods” with “Magritte Rider by derbuder,” a mashup of Magritte’s setting with a photo of a girl and her horse. The Magritte seems at first glance so diffident that the trick takes a moment to emerge, and a second and third look to discover its complexities. Simple-seeming as it is, it doesn’t leap out at you. Whereas in Derbudr’s pleasant souvenir the intention of the image is lost in delight in the rider and her horse. The supercharged color, the visual busyness of the girl, the white face and forelegs of the horse, leap out and grab the eye. You can’t relax your view, as you can with the Magritte, see the whole thing at once, and then explore. The clamoring detail overwhelms the ensemble, which is what sustains the illusion. 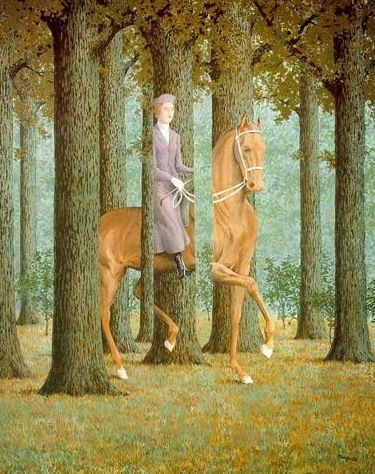 While we’re on the subject, it should be noted that while Magritte’s style is reticent, it’s not flat. The patterns and textures of branches and leaves, tree trunks and foreground vegetation, even the pale, restrained rider and her pale, restrained horse are intricate and delightful—increasingly so, the longer you study them.